We become what we repeatedly think. -Melanie Greenberg, Ph.D. I was delighted when a client told me he was feeling pretty good because he had found a great mood changer. I asked what his tonic was, and he said, “Positive what-ifs.” When he caught himself saying, as was his norm–“What if I lose my job?” “What if I get sick?” “What if I fail?”–he swapped those questions for “What if I keep my job?” “What if I stay healthy?” “What if I succeed?” He is now a believer in Dr. Greenberg’s philosophy. Say your “positive what-ifs” at a snail’s pace, allowing them to sink in slowly and deeply. Because this practice is not magic, the boost you would like usually requires relaxed repetition. Knowing this will save you from discouragement and giving up. 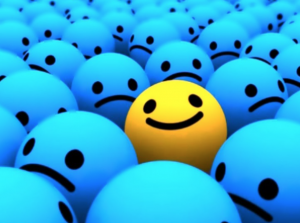 If you are immersed in sadness or depression, trying to be positive can backfire on you. You may have to first calm your feelings through meditation, a good walk, or a talk with a friend before your positive what-ifs can take root, and actually change your mood from low-spirited to upbeat.